Upgrade today to the fastest and most effective security solution you can buy. Symantec Endpoint Protection 12.1 detects, blocks, and removes more threats than ever before. Better security: Symantec Endpoint Protection 12.1 offers the latest detection technology, including Insight and real-time behavioral monitoring through SONAR. Built for virtual environments: Virtualization solves many problems—but security isn’t among them. Protect your virtual desktops and servers with a solution tested and optimized to run seamlessly in VMware®, Citrix®, and Microsoft® virtual environments. Faster and more flexible management: The management console in Symantec Endpoint Protection is faster and more powerful than ever before. Upgrading from previous versions of Symantec Endpoint Protection is simple and seamless. Smart scheduling technology: Identifies when your computer is busy and stays out of your way by performing noncritical security tasks when your computer is idle. 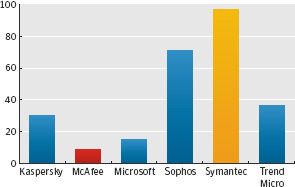 Symantec Insight tracks nearly every program on the Internet. It uses file age, frequency, and source along with other security metrics to expose threats others miss. Based on results from over 175 million systems in over 200 countries, Insight uses the context to identify rapidly changing threats. Symantec Insight Separates files at risk from those that are safe, for faster and more accurate malware detection. Real-time heuristics Monitors files as they execute for malicious behavior. Real-time SONAR Examines programs as they run, identifying and stopping malicious behavior even of new and previously unknown threats. Browser Intrusion Prevention Scans for drive-by downloads and attacks directed at browser vulnerabilities. Symantec Power Eraser Powerful tool for removing malware on heavily infected machines. Cloud scan Checks online for the most recent risk information for files and processes. Faster and more scalable central console Increased responsiveness and the number of users supported per manager. Enhanced LiveUpdate performance Uses fewer memory resources. Smart scheduler Stays out of your way by performing security tasks when your computer is idle. Symantec Endpoint Protection Management Console Integration with Symantec Workflow Optimizes efficiency, enforces processes and policies, and automates redundant tasks. Enhanced client deployment wizard Allows new installs and upgrades to be faster and easier than ever before. Symantec Endpoint Protection for Mac® Endpoint security for Mac OSX, now managed through the Symantec Endpoint Protection Manager. Built for virtual environments Enhanced features to help protect your virtual infrastructure. What is the Symantec Backup Exec™ 3600 Appliance? Backup Exec 3600 Appliance provides Backup Exec software, optimized hardware, and licensing all integrated in a single, affordable appliance from the industry leader in backup—Symantec. Easily backup both physical and virtual environments while reducing storage costs and improving backup performance through integrated data deduplication. What are the benefits of an appliance backup and recovery solution? Appliances are a proven delivery platform for software applications in the security, communications, and storage markets. An appliance form factor means just one vendor designs, certifies, and supports the total solution, rather than forcing users to deal with multiple vendors for each of the components (such as hardware, OS patches, software configurations, etc). This reduces management complexity and integration costs, eliminates vendor finger pointing, and more importantly, improves time resolution. Backup Exec appliances also offer "all-in-one" benefits, providing comprehensive protection and recovery capabilities, whether running Windows®, Linux®, Mac®, Microsoft® applications, Lotus Domino®, Oracle®, or virtual systems with VMware® or Microsoft Hyper-V®. When is the appliance generally available? The Backup Exec 3600 Appliance is generally available on 30 August 2011 in the United States and Canada, with a phased roll-out to other countries in the near future. What is the storage capacity of the Backup Exec 3600 Appliance? The Backup Exec 3600 Appliance comes standard with 5.5 TB of fixed usable disk storage. Because it includes data deduplication technology, the storage capacity scales to protect much more than 5.5 TB of front-end data. Is the storage capacity expandable? The storage capacity for Backup Exec 3600 Appliance is not expandable at this time. How is the appliance licensed? The Backup Exec 3600 Appliance is a single license SKU that includes Backup Exec software and optimized hardware, with the licensing option to choose one or three years of bundled maintenance (advanced system replacement and 24 hours a day, seven days a week hardware and software support). With a single license SKU, users can utilize the full disk capacity of the appliance for an unlimited number of source systems. The appliance licensing bundle also includes Backup Exec Agents and Options that will optimize backup and recovery for all of the appliances' supported systems. To learn more and to download the Backup Exec 3600 Appliance licensing guide, please visit: www.backupexec.com/3600licensing. What agents and options are included and pre-licensed in the Backup Exec 3600 Appliance? The Backup Exec 3600 Appliance comes standard with an unlimited number of selected agents and options to protect up to 5.5 TB of maximum storage at no additional charge, see table below. Optional licenses are purchased separately and there are a small number of Backup Exec Agents and Options not supported in the Backup Exec 3600 Appliance, both of which are also detailed in the table below. Does the appliance come with a hardware warranty? Yes, the Backup Exec 3600 Appliance comes with a one or three year advance replacement hardware warranty. How does the Backup Exec 3600 Appliance receive hardware warranty service? Hardware warranty service will be delivered through an advanced replacement program. Customer replaceable parts, such as hard drives and power supplies, will be shipped overnight to the customer. If support determines there is an issue with a non-replaceable part, a replacement appliance will be shipped overnight to the customer. All hardware warranty support is initiated through Symantec Technical Support. Can I upgrade the Backup Exec software when newer versions are available? The Backup Exec 3600 Appliance is shipped with Backup Exec 2010 R3 and will be fully upgradable to newer versions of Backup Exec software, as long as your maintenance/support contract is active. Is data deduplication technology included? Yes, support for source or target deduplication will be available and is included at no additional charge, making the appliance unique in offering a backup solution with highly flexible deduplication. Learn more about deduplication at: www.backupexec.com/deduplication. Will I be able to buy Backup Exec appliances through my reseller? Yes, the Backup Exec 3600 Appliance is available to purchase through Symantec’s channel partners. Will Backup Exec appliances and Backup Exec software work together? Yes, Backup Exec appliances will operate seamlessly together with Backup Exec software and multiple instances of both can be managed through the Backup Exec Central Administration Console (CASO). How can I get in touch with Symantec Technical Support? For information on how to contact Technical Support, please visit: http://www.symantec.com/business/support/contact_techsupp_static.jsp. For non-technical inquiries, such as licensing, product delivery questions, maintenance renewal, or other non-technical questions, please visit: http://customercare.symantec.com/. What training programs are available? Symantec offers a broad suite of unrivaled technical training programs and resources designed to ensure you quickly become proficient in Symantec’s award-winning backup and recovery solutions. To learn more, please contact your preferred Symantec reseller or visit: www.symantec.com/training. Where do I go for more information? For more information about the new Backup Exec 3600 Appliance or Backup Exec, please visit www.backupexec.com, follow us on Twitter™ at @backupexec, or call 1-800-721-3934. To speak with a Product Specialist in the U.S.
To speak with a Product Specialist outside the U.S.
For specific country offices and contact numbers, please visit our website.